Why Trade DAX ‏(GER30) with XM? At XM we offer DAX ‏(GER30) as cash and futures CFDs. Our cash index CFDs are undated transactions that aim to replicate the cash price of the underlying index, and so they are adjusted for interest and dividends. Index futures CFDs expire on specific future dates and are cash-settled on the expiry date. 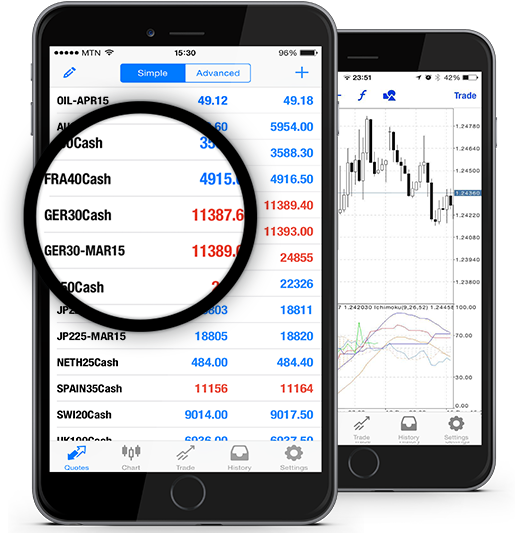 DAX (GER30), which stands for Deutscher Aktienindex, is the principal German stock market index representative of the 30 major companies that trade on the Frankfurt Stock Exchange and considered a blue chip index in terms of quality and profitability. The majority of the Frankfurt Stock Exchange stock shares are traded, with index prices calculated by the second, on the Xetra electronic system. The DAX (GER30) index represents about 75% of the aggregate market capitalization, which is the total dollar market value of the shares being traded on the Frankfurt Stock Exchange. The fact that DAX (GER30) measures the 30 largest German companies’ performance, along with Germany being the strongest economy in the Eurozone, ranks DAX (GER30) as the leading stock index to European investors. How to Start Trading DAX ‏(GER30)? Double-click on DAX ‏(GER30) from the “Market Watch” to open an order for this instrument.